Among the U.S.’ 50 largest school districts, CPS teachers’ pay ranks No. 1 for teachers with a bachelor’s degree and five years’ experience, No. 2 for first-year teachers with a bachelor’s degree, and No. 3 for first-year teachers with a master’s degree. The Chicago Teachers Union, or CTU, on Feb. 1 rejected Chicago Public Schools’, or CPS’, contract offer, which would have provided salary increases for teachers but required that they contribute fully to their pensions. Given CTU’s rejection of the contract – and the vitriol that CTU officials directed at CPS after the district’s Feb. 2 announcement of layoff plans and other cost-saving measures – the taxpayers who pay the teachers’ salaries and benefits should consider the teachers’ current pay. Chicagoans can ill afford another CTU contract that includes big pay raises – according to U.S. Census Bureau data, the median earnings of the Chicago taxpayers paying teachers’ salaries was $31,096 between 2009 and 2013. The median salary for a CPS teacher, on the other hand, is $78,910. Chicago public school teachers are also well-compensated compared to their peers in other districts. 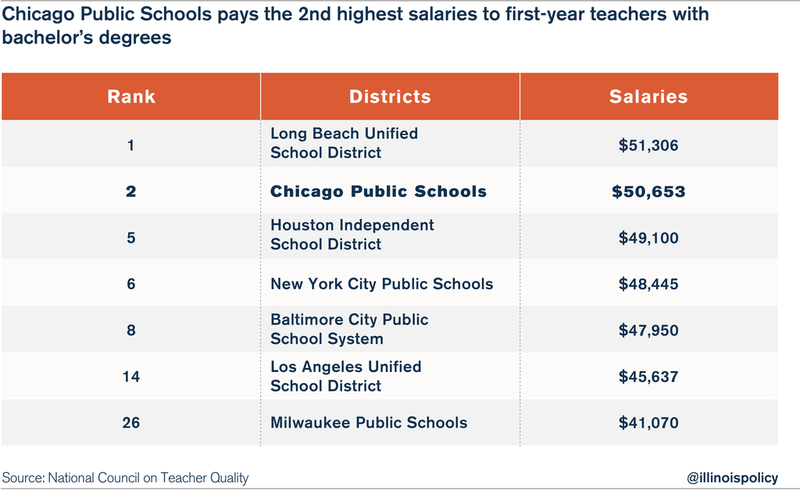 A comparison among the 50 largest U.S. school districts reveals that Chicago teachers now rank among the top three highest-paid groups of teachers in each of the three categories of teacher pay measured by the National Council on Teacher Quality. After five years on the job, CPS teachers with bachelor’s degrees earn $61,831, the highest salary among teachers in this category in all of the 50 largest school districts in the country. Philadelphia comes in second place at $60,202, and Anne Arundel County Public Schools in Maryland finishes third at $54,202. New York City pays teachers in this category $53,329, and in Milwaukee, these teachers make $46,085. CPS teachers start at the second-highest salary among teachers in the 50 largest school districts in the nation. A first-year teacher with a bachelor’s degree in Chicago earns $50,653. At $51,306, only first-year teachers in Long Beach, California, earn more. By comparison, other school districts similar to CPS set starting teacher pay at between $45,637 (Los Angeles) and $49,100 (Houston). New York City teachers earn $48,445 their first year, and in the Baltimore City Public School System, these teachers make $47,950. Milwaukee Public Schools pays teachers in this category $41,070. A CPS first-year teacher with a master’s degree earns $54,161, the third-highest salary among the 50 largest school districts, behind the Baltimore City Public School System in Maryland ($59,904) and New York City ($54,459). In Houston, these teachers earn $50,100, and in Milwaukee, $42,286.